The plane stayed low enough and the clouds sparse enough that we could see ground from the window for most of the flight from Beijing to Ulaanbaatar. For the first 20 minutes or so I marvelled at the expanse of mountains, which seemed neverending. I imagined being on a train, snaking through those mountains towards Mongolia. It must be beautiful. But soon we had seen the last of the mountains, and were flying over a flat, brown landscape. The rest of the two hour flight was over this increasingly empty landscape. I know there can be great beauty in desert landscapes, but I couldn’t see it from the plane. 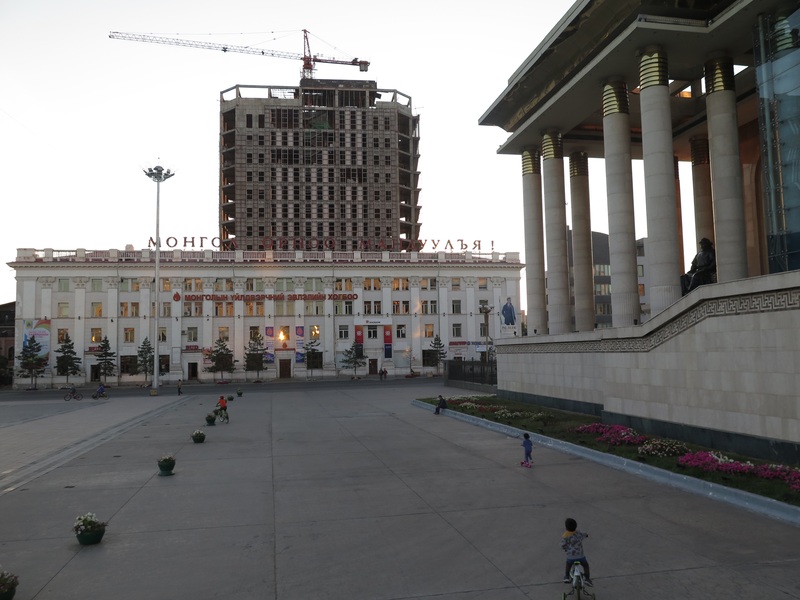 I said to Steve, “How long is the train ride from Beijing to Ulaanbaatar?” We agreed it was somewhere around 20 hours. (Looking it up now, I see we were wrong; it’s more like 27 or 28 hours.) “Half of that must be in the mountains,” I said. We agreed that it would be nice to take the train, someday. We landed in a small airport, and breezed through immigration. (I think there may have been as many as four foreigners on the plane. Our line was short.) Bags came quickly, and in something like 20 minutes we were outside of customs and looking for our ride to the guesthouse. Once we’d settled our bags, we went out for a walk, and eventually found ourselves downtown. We had a fancy dinner at a restaurant recommended by our guidebook (it was supurb), in part for its splendid view of the Choijin Lama Temple. View of the Choijin Lama Temple from outside its enclosing wall, near the Silk Road restaurant. 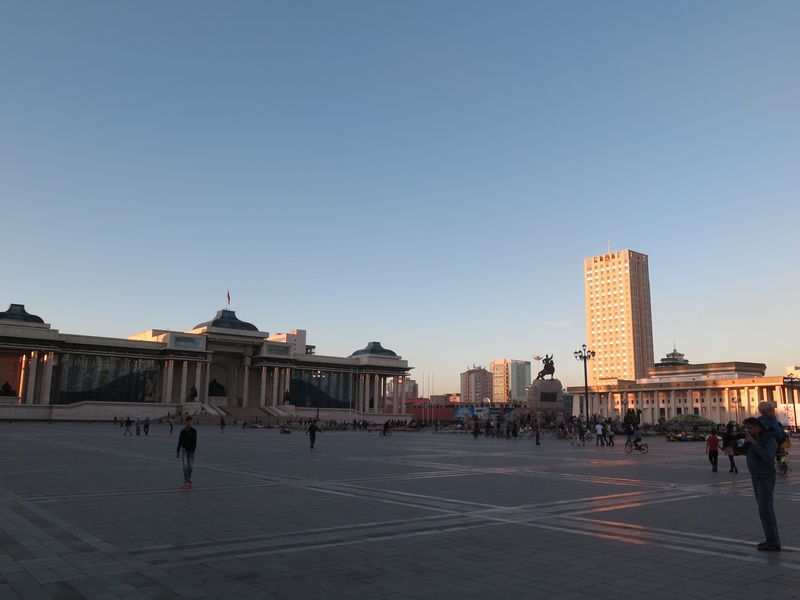 Following dinner, we walked across the way to Sükebaatar Square. It was dusk as we walked around, and the light made everything glow. 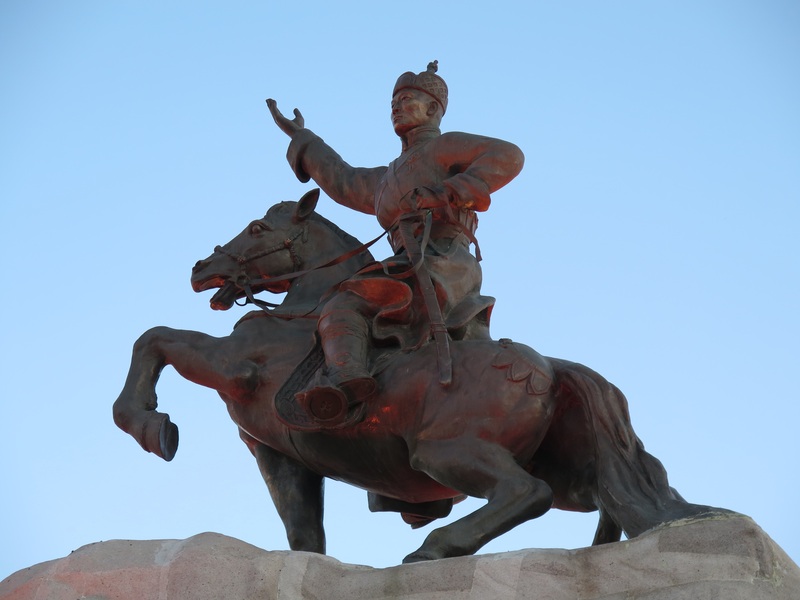 The statue of Damdinii Sükhbaatar in the center of the square glowed almost golden. 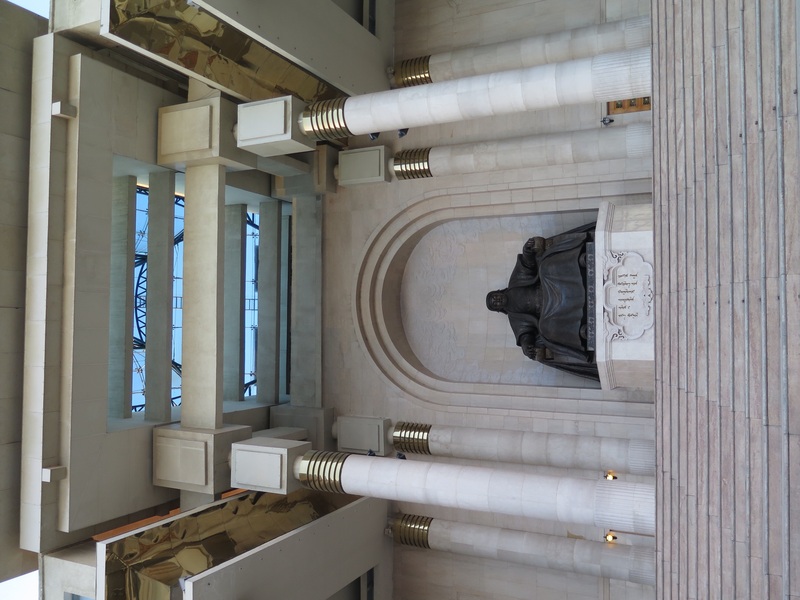 Statue of Damdinii Sükhbaatar, who was a leader of Mongolia. 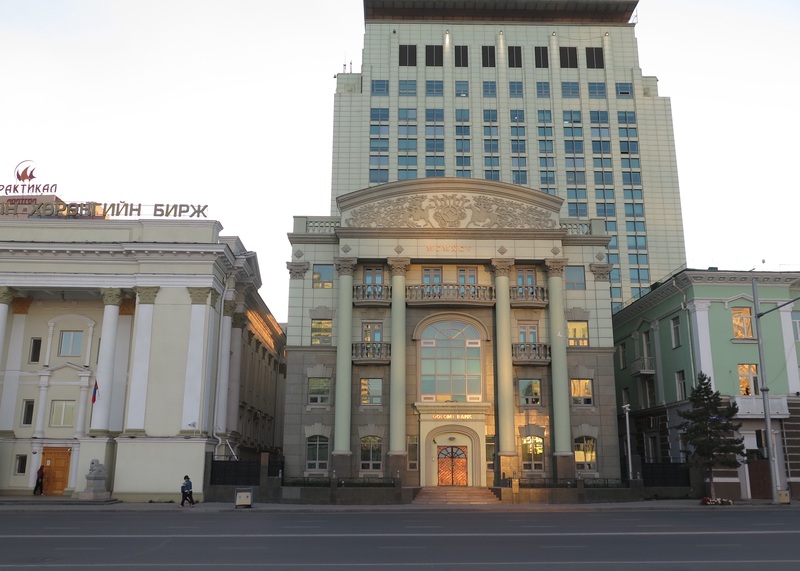 The square here is wide and paved, and is a gathering place for locals. Children rode around on a variety of wheeled devices (roller skates, bicycles, scooters, etc.) while adults watched and wandered. Tourists took pictures, though really there are fewer tourists here than I would expect. It was a magical time of day. This building glowed like a gem in the evening light. I only wish I could have really captured how beautiful it was. 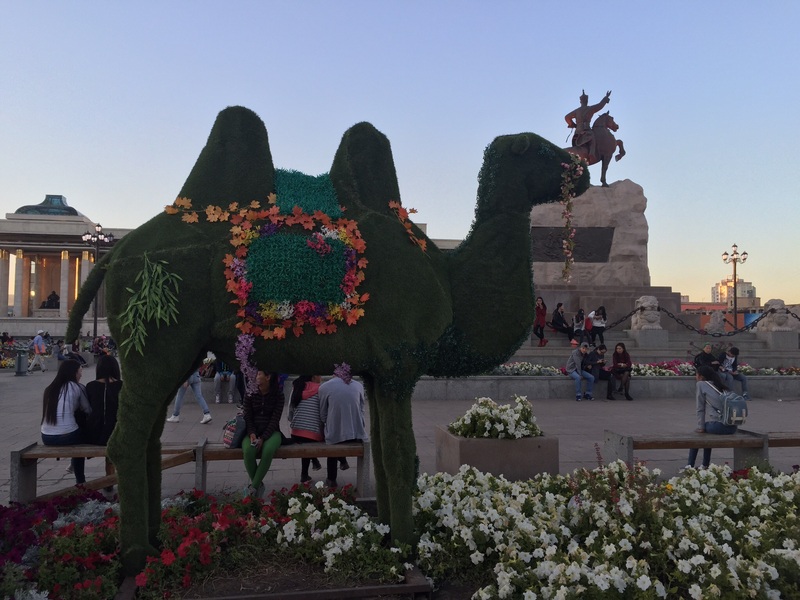 The camel was covered in astroturf and plastic flowers.